The busiest metro system in Canada and there is a reason behind that. The Montreal metro which operates in Montreal, Quebec, Canada, is the backbone of the public transportation system of Montreal, with an annual ridership of 356,096,000 as of 2013. It is only behind New York City and Mexico City in North America and is considered the third-busiest metro system in North America. It began operations way back in the year 1969. Now, this nearly 70 km long network, runs across 4 separate lines and serves a total of 68 stations. The mammoth task of operating this metro system, which once carried nearly 7 billion people in one year (that was almost the entire population back then in 2010), is with the Societe de transport de Montreal. The timings of the Montreal metro differ with the lines and also with the stations. It generally begins operations at around 05:00 am in the morning and runs till nearly 01:00 am, the next day. Just like the timings, the same conditions are applicable to the frequency of the trains. Sometimes just 3 minutes between two trains and sometimes 11 minutes, it all depends on the line, day and station. The metro service can be utilised via a ticket or the Opus card. Regular users are recommended to purchase the Opus card. The fare for a single trip is $3.25, while 2 trips for the same person cost $6.00. Similarly, 1 day and 3 day passes are also available. They cost $10.00 and $18.00, respectively. The weekly pass which is effective from Monday-Sunday costs just $25. For a week, there is no limit on the number of trips one takes. An investment of $82.00 needs to be made for those interested in purchasing a monthly pass. For different age categories, different fares apply. The above mentioned fare is for a normal adult. Children are subject to certain concessions which differ with their age group. The two sets of groups that the children are divided in are: 6-11 years and 12-17 years old. Their fare is generally a little higher than half the price of an adult ticket. Students between the age group of 18-25 and senior citizens above the age of 65, also enjoy such concessions on their tickets. Close to some of the metro stations, parking lots for bicycles are available. Firstly, smoking and drinking are strictly prohibited. The rule against smoking is so strict that, e-cigarettes are not allowed either. Bicycles can be taken inside the metro however, riding them inside the metro network is not allowed. Not just bicycles but other similar things as well, like a tricycle for example. Map of Montral Metro showing various Stations and Route lines. Click on the map to zoom it. 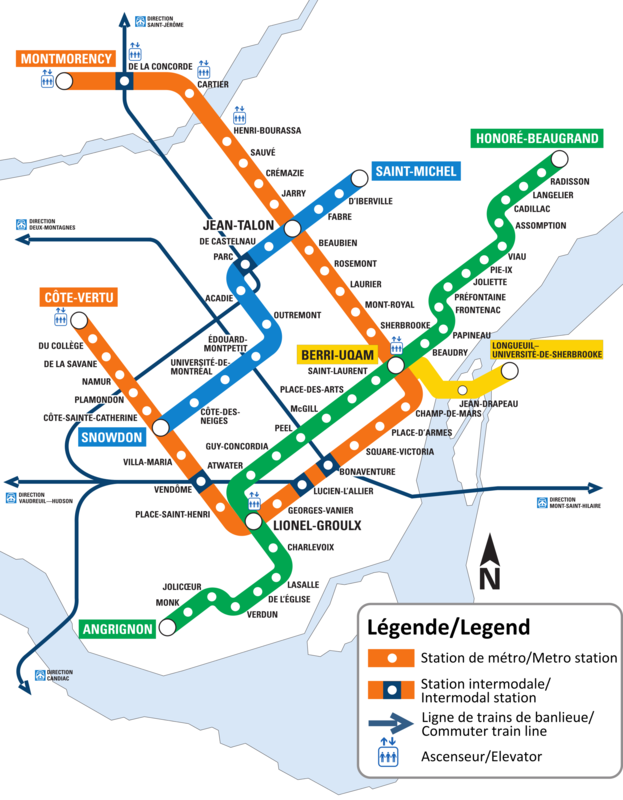 You can also Download the Montreal Metro Map PDF.